From the above quote, one can easily understand the importance of Stress Management in daily routine. Nowadays, when life has become super fast, there is bound to stress. The successful people are those who can manage stress effectively and bring their best to the table. Many of you would be thinking that What’s all this fuss about Stress Management? It’s not a big deal at all. However, let me tell you that, it has become a global issue. You may have seen a lot of top athletes & celebrities getting sucked into depression and ruin their life. According to a survey carried out by the American Psychological Association, 75% of adults in the US are suffering from high level of stress & anxiety. It tells you that Stress can affect anyone and you need to be aware of the various Stress Management techniques to get rid of it. Taking this scenario into perspective, today we’re going to provide you with innovative ways to manage the Stress. So, let’s get the things moving, right now.! The first and easiest thing that one can do for reducing stress is avoiding products like Caffeine, Alcohol & Nicotine. The reason behind that is, it increases your stress levels. So, instead of utilizing these products, one can opt for water, herbal tea or natural fruit juices. If you’re in stress, you’ll often feel an adrenaline rush. For getting rid of this situation, physical activity or exercise could be your best bet. It can help you to bring calmness in your body & mind and puts you in a relaxed environment. You can also go for a walk in the fresh air. Lack of sleep is one of the root causes of stress. Therefore, you should focus on getting more sleep. One of the ways to do that is creating a relaxed environment in your bedroom. Before going to sleep, you should give 1 hour in the thing that you like. It will surely calm the nerves. In today’s day and age, it’s imperative to give yourself an hour where you enjoy and relax. For that purpose, you can try out various relaxation techniques. One of the popular ones is to focus on positive words such as “love,” “calm,” “peace,” etc. It will make you relax, for sure. When you’re under the pump, a good conversation with someone can take away the stress factor. Stress often distracts you from making an accurate decision and that’s why discussing the issue with someone can be helpful. It is like pressing a refresh button. You will surely get reenergized. One of the best Stress Management techniques is to maintain a stress diary. In this dairy, you should note down the sequence of events when you’re feeling the stress. It will help you to analyze the situation or thing that caused you the stress. So, you can avoid them in the future. The successful people are the ones who can manage stress and take the situation of the control. Do not let the situation take control of you. One of the effective methods for that is pinning down the issue and also its possible solutions. From this analysis, you will be able t find the best case. Not managing the time can also invite stress in your life. It means Time Management is a very crucial aspect of Stress Management. You need to make a priority list for your task and then, decide how many hours are enough for that task which will reduce the stress. It is one of the most underrated but effective ways of dealing with stress. You can’t make everyone happy at the same time. Therefore, saying ‘NO” sometimes helps and knowing your limitations is also vital. For maintaining a relationship, you should not sacrifice your health. If you’re not feeling well, don’t go to work. Resting is extremely important for reducing stress. If you think that you can carry on the job in spite of sickness in the body, you will have to pay a heavy price for that. All these add up to the stress level. So, make you make the right move. 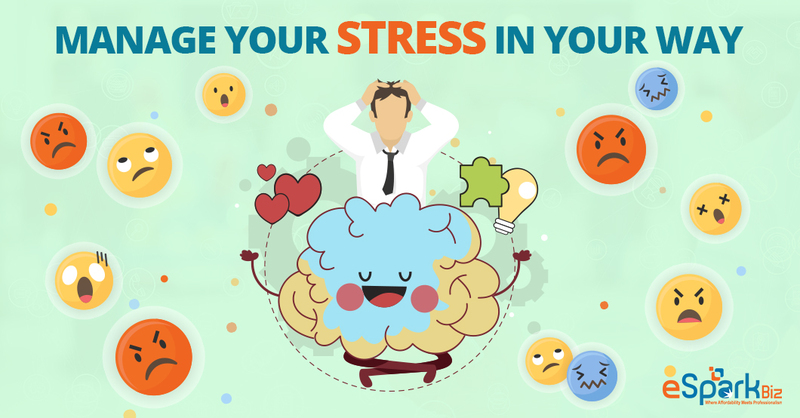 Nowadays when Stress Management has become a crucial aspect of life, this article will help you to manage the stress in your daily routine without spending any money. If you still have any question or suggestion related to this article, feel free to ask them in our comment section. Thank You.! Harikrishna Kundariya, a marketer, developer, IoT, ChatBot & Blockchain savvy, designer, co-founder, Director of eSparkBiz Technologies, an Mobile App Development Company. His 8+ experience enables him to provide digital solutions to new start-ups based on IoT and ChatBot. A ChatBot Development Company, eSparkbiz has reached to greater heights with his immense contribution. Be Healthier with Stress Management.